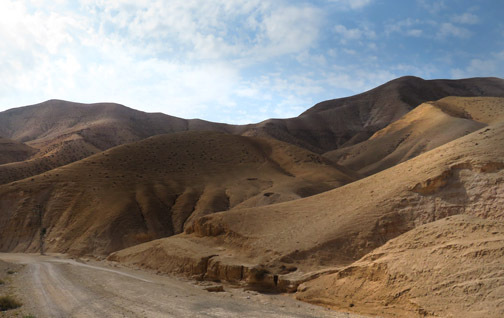 On our way to the Dead Sea we drove through the Judaean Desert. It is a very barren place. 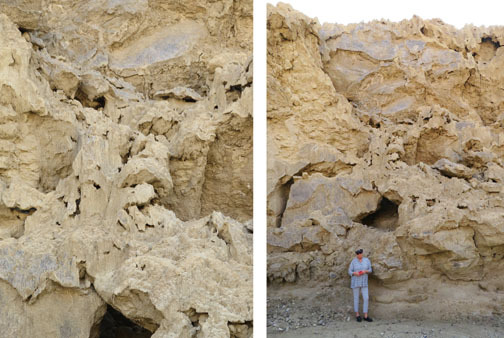 The limestone mountains have eroded producing deep ravines (wadis) that make the landscape appear very rugged. 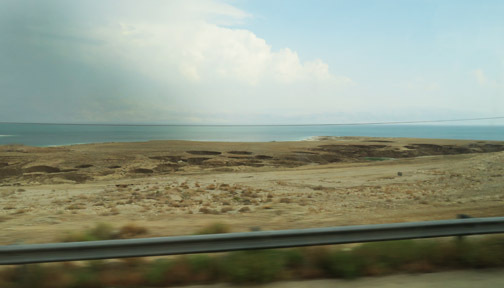 Then we drove along the coast of the Dead Sea and saw sink holes that have formed in the last 20 years because, due to global warming, the desert is drying out, the water level of the Dead Sea is decreasing, and the sandy rock has become less stable. This area used to have recreational areas along the coast. Now because of the danger of sink holes, there are fences and warning signs everywhere. While we were driving along, we had a rain storm that came and went very quickly. We later learned that not long after we had passed by, a flash flood caused a section of the road to collapse. 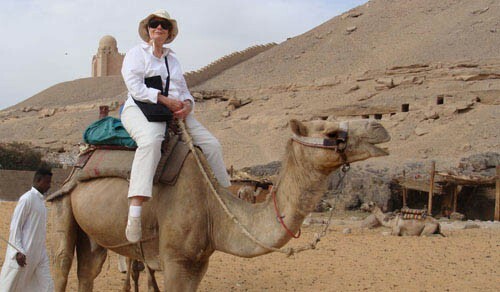 We also learned that when there is a storm in Jerusalem, the water runs to the Dead Sea which makes sense since the elevation is 1412 ft. below sea level – the lowest place on earth. This was the same storm that caused flash flooding in Petra. Right next to the Dead Sea are mountains and on the top of one of them is Masada, a fort and palace built by Herod in 30 BC. He built it because he had a lot of enemies and wanted a place where he could get a way and be safe. 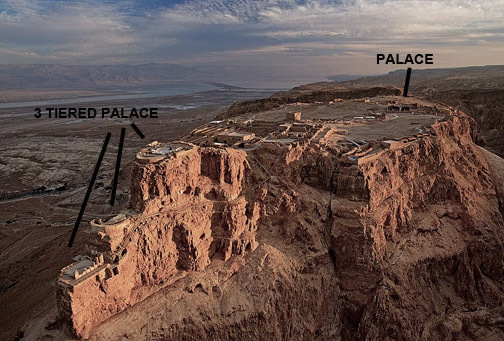 The top of the mountain is a plateau measuring 1,800 ft by 890 ft. Herod built a wall around the top of the mountain with many towers, and the fortress included storehouses, barracks, an armory, two palaces, and cisterns that were refilled by rainwater, as well as baths. The large palace he built for himself sits at the north end where the cliffs are very steep. The palace was built on three levels. We got to the top by cable car. One member of our group hiked up. It took him about an hour and 15 minutes to walk a very steep path. 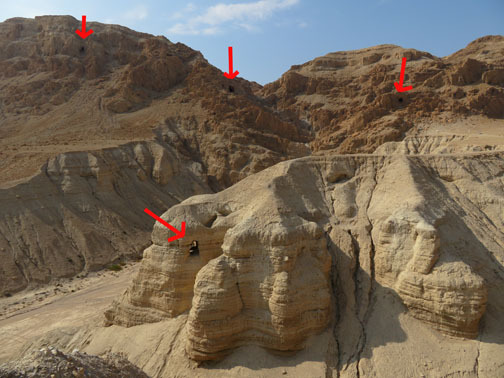 Left: For scale, the arrow is pointing to a group of hikers who are wearing red shirts. 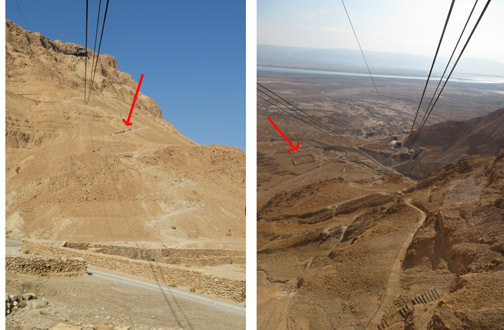 Right: The arrow is pointing to a rectangle at the base of the mountain. It is what remains of a Roman military camp. Some of the ruins of Herod’s palace. Herod died in 4 BC. and the palace was abandoned. 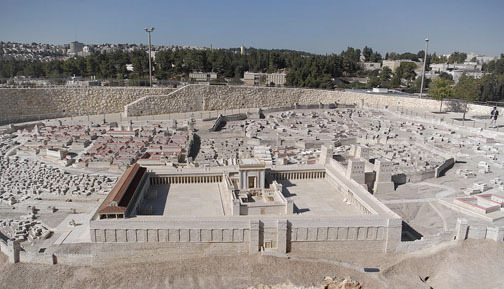 In 70 AD the Second Temple was destroyed by the Romans and the Jews were run out of Jerusalem. The Romans were intent on getting all Jews out of the whole area and many fled to other parts of the world. 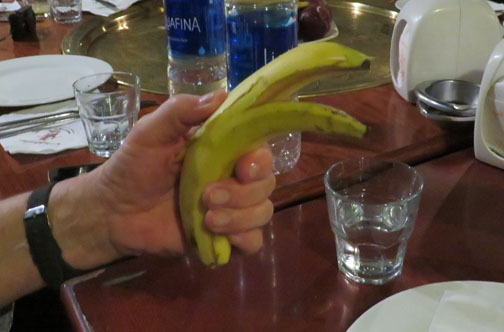 There were still some Jewish resistance, and a group of dedicated resisters settled into Masada. 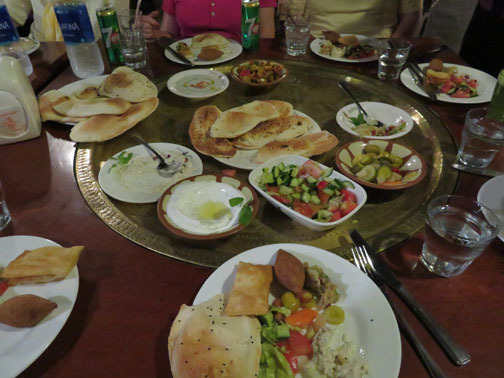 There they discovered food stored away in Herod’s storerooms, enough food to last for 7 years. And they had Herod’s system of trenches and cisterns for collecting water. 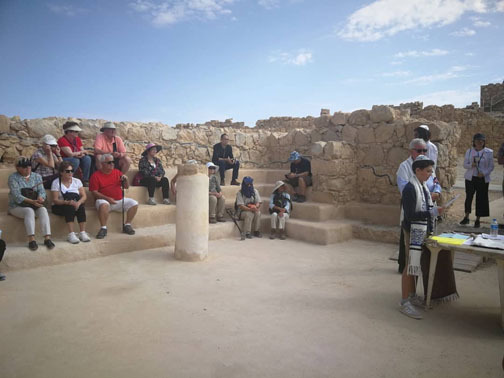 Herod’s fortified structure, surrounded by steep cliffs, protected the resisters and their families, numbering 960, from the 15,000 Romans who built 8 military camps at the base of the mountain. But there was one cliff that was not as high, so the Romans, used Jewish slaves who had been captured in previous battles, to construct a ramp to the top. It took 2 years to construct the ramp and tons of rock. In the meantime, the Romans could not understand why the resisters didn’t die of starvation since the could not leave the fort to obtain food or water. Then in 73 AD, the Romans brought in a huge battering ram, dragged it up the ramp and breached the walls. Legend has it that all they found were dead bodies, except for two women and five children hiding in a cistern. The story goes that the resisters decided that they did not want to be taken captive. Since Jewish Law forbids suicide and the penalty is no afterlife, they killed each other, including their families members, and picked by lot, the person who would be the last, and he would sacrifice an afterlife and kill himself. The story goes that the women told the Romans what happened and it was recorded. 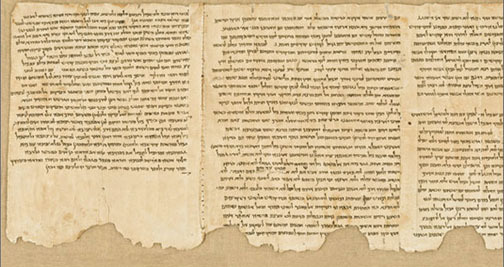 Since there is no archaeological evidence to document the event, it is disputed by scholars. 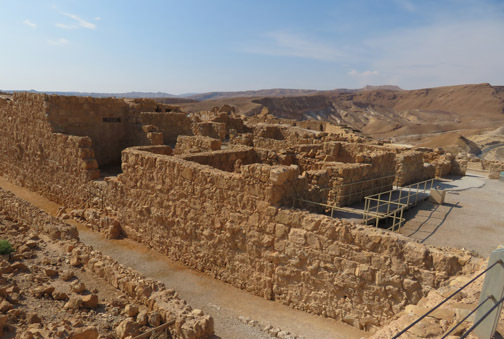 At any rate, Masada was the last stronghold of Jewish resisters which began the Jewish diaspora. 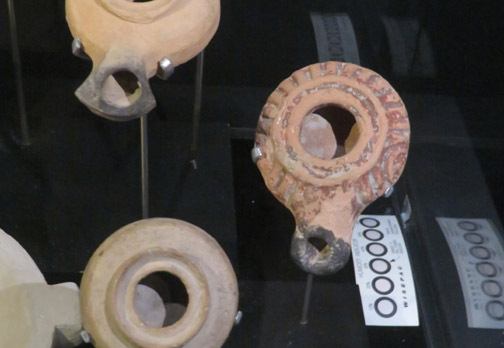 In the museum at Masada I saw tiny oil lamps that dated back 2000 years. I bought a reproduction of one in the market in Jerusalem as a souvenir. 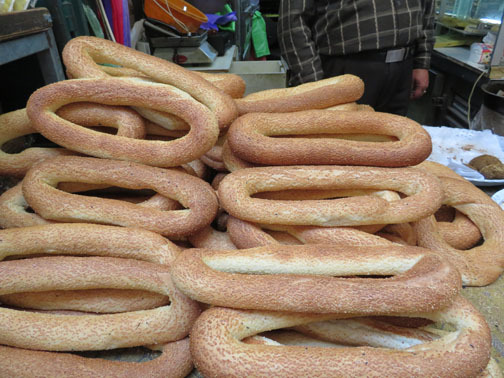 I was very proud of my bargaining skills when I haggled the price down from 50 shekels to 15 ($4.30) until I left the store and saw them at another shop marked 10 shekels! At the Dead Sea we stayed at resort/spa hotel where most of the guests were Russian. Most of the staff was Russian as well. They are very serious people. Our guide, whose mother is Russian, admits that they can be very pushy. 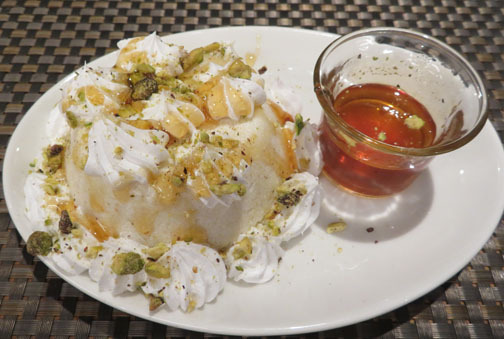 The popularity of the area for spa treatments is because there are a number of factories in the area that produce beauty and skin products with minerals form the Dead Sea. The water of the Dead Sea is a beautiful turquoise color, not a deadly color at all! Of course we bathed in it and the buoyancy of the water made it bouncy! I felt like a coke bobbing around! 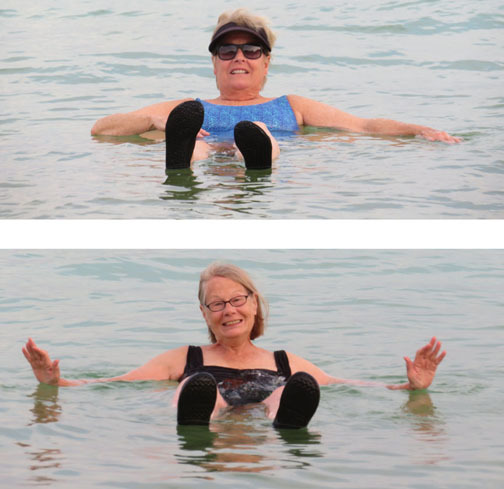 Once I got the hang of it, floating was very relaxing. It was hazy while we were there. 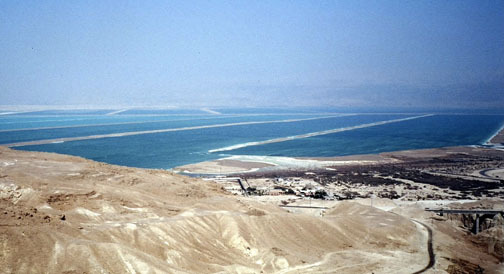 Across the water are the mountains of Jordan. Before we left the Dead Sea we took a Jeep Tour of the desert. 17 of us piled into 4 Jeeps. The sky was hazy which made the landscape look dreamy. We stopped to examine the large deposits of salt in the rock. I was fascinated with the rock patterns created by erosion. The ride through the desert was bumpy as the trail curved and had lots of ruts. 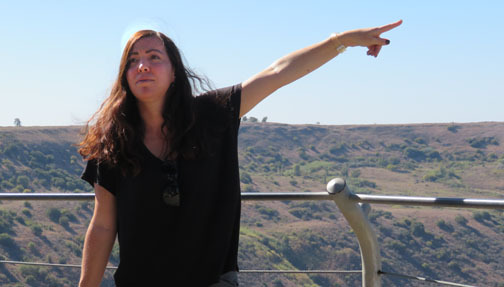 Our guide discussed the current controversy of the future of the Dead Sea. On this map, the larger sea area is naturally formed. Below that is an artificially made sea where water from the Dead Sea is piped into evaporation flats where industries harvest chemicals including potash, magnesium, and bromine. 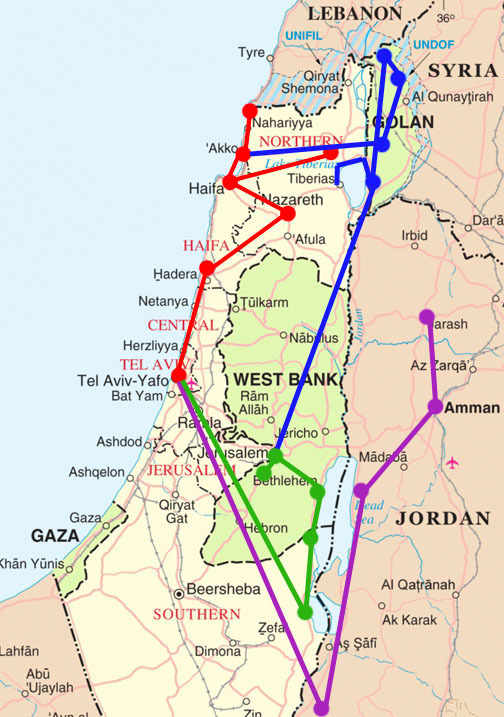 The industries date back to the 1930s, before Israel was formed, and they are privately owned. A large amount of the chemicals go to Asia for fertilizer. The companies are taxed, but they still make a lot of money for the owners. They also employ a lot of workers and most of the resort/spa hotels are located along the shores. 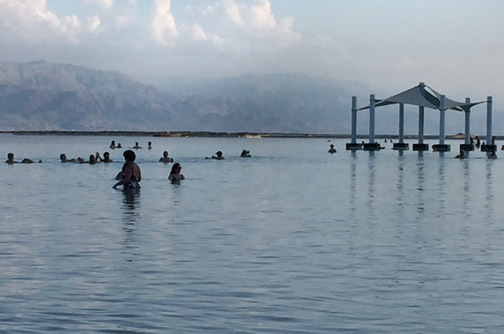 The problem is that the level of the Dead Sea is decreasing with global warming and the piping of water out of it for the industries isn’t helping. The industries also cause pollution, and the foundations of the hotels along the artificial sea are corroding, and it is extremely expensive to repair and stabilize them. 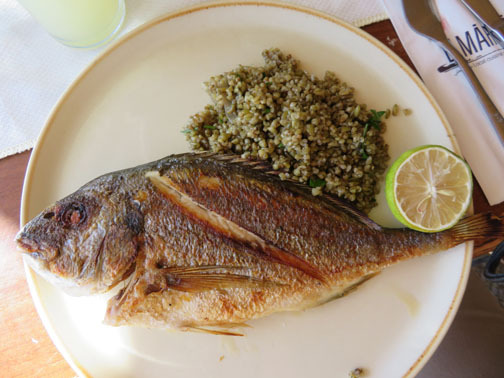 There have been talks of constructing a pipe line to bring in water either from the Mediterranean or the Red Sea, however, there might be problems with these waters chemically mixing with the Dead Sea water. Also, it would be enormously expensive to pipe in water for the industries. 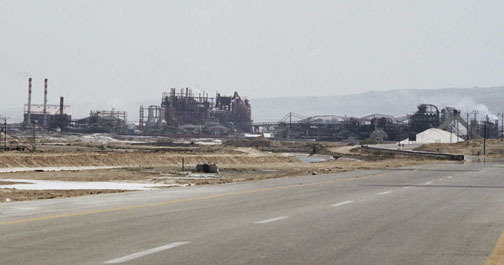 Not an easy solution – save the industries, hotels, and jobs for private companies at public expense or save the Dead Sea and the environment by closing them down. 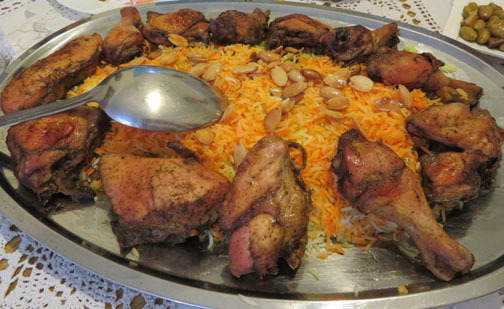 Stay tuned for food and people of Jordan and Israel. 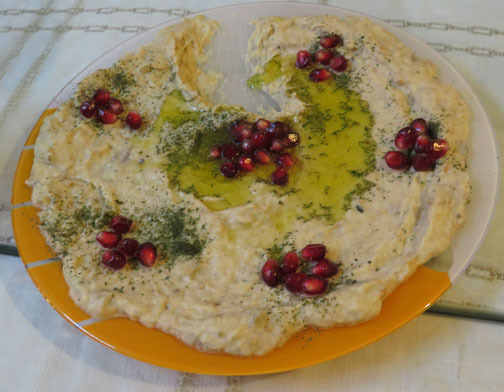 This entry was posted in Israel on November 11, 2018 by JWH. 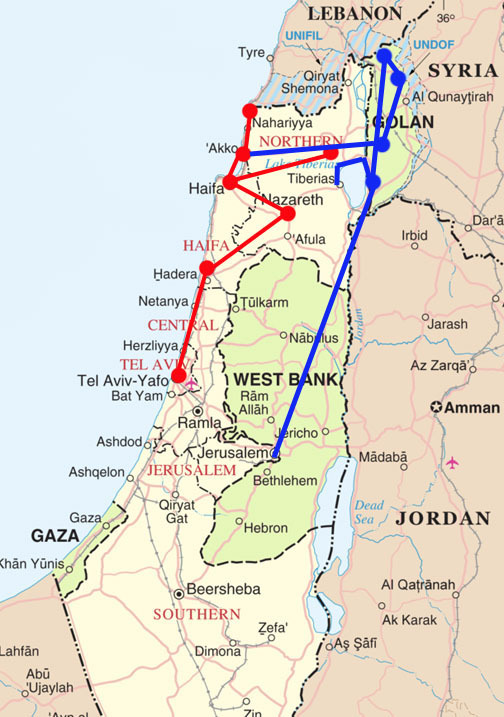 The map shows our travels from Haifa to Jerusalem in blue. While in Jerusalem we visited a number of Christian sites that are also important to the Muslim faith. 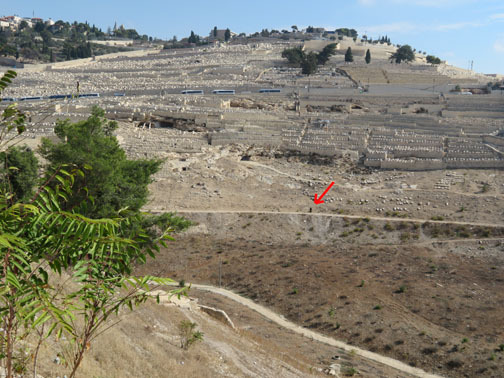 Some of the sites have some archaeological evidence, whereas the only evidence for other churches is that they were built on the ruins of earlier churches marking a Holy Site. 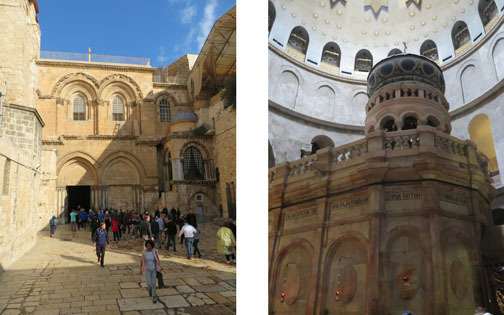 First we visited the Church of the Holy Sepulcher, the place where it is believed Christ was buried and resurrected. The tomb is surrounded by an enclosed chapel. 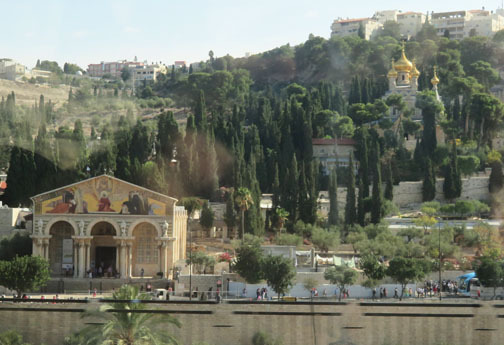 Another church we visited was the Catholic Church of Gethsemane, also called the Church of All Nations because it was built with funds from Catholic Churches from all over the world. 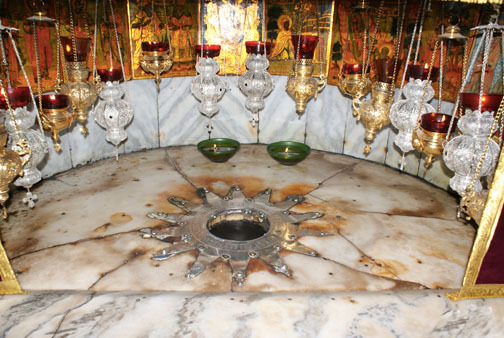 It is the disputed site where Christ prayed and his disciples slept the night before he was crucified. 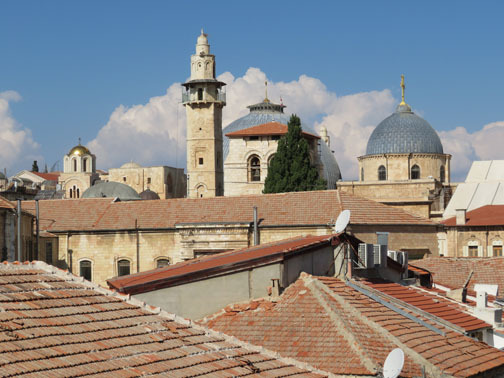 It is located at the base of the Mount of Olives and is the church in the foreground. 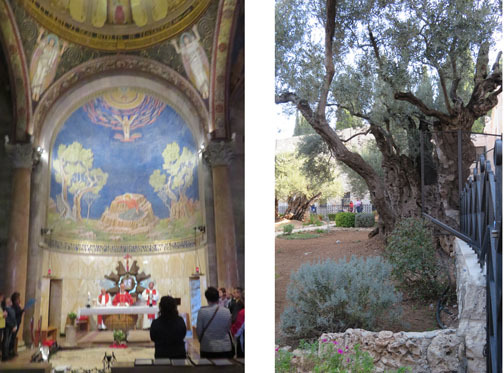 Next to the church is a garden of very old olive trees, one of which dates back to the time of Christ. 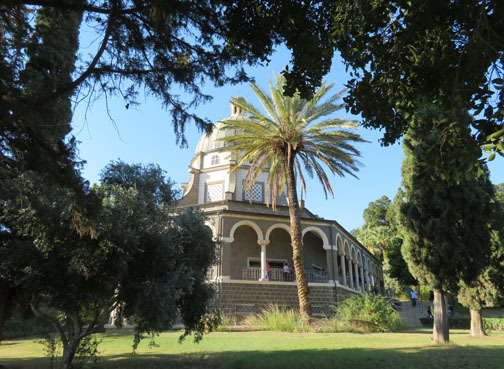 We visited Mount Zion and the location of the Last Supper and passed several locations of the Stations of the Cross. Since it is the height of tourist season, the Old City was packed with people from all over the world as well as the local people going about their everyday business. We also saw many large groups of religious pilgrims. We visited the archaeological site of the City of David, the oldest part of the city near the Mount of Olives which is now a Jewish cemetery. Look for the figure on the path at the bottom of the photo as well as the large tour buses to get a sense of scale. 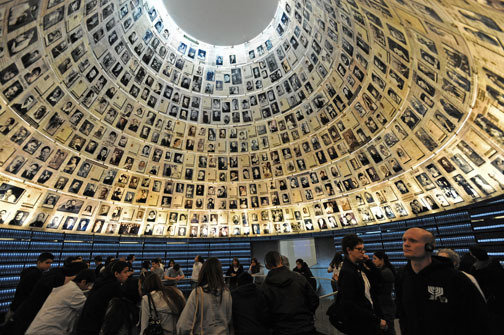 As for museums, we visited the Historical Museum of Israel and the Holocaust Museum. 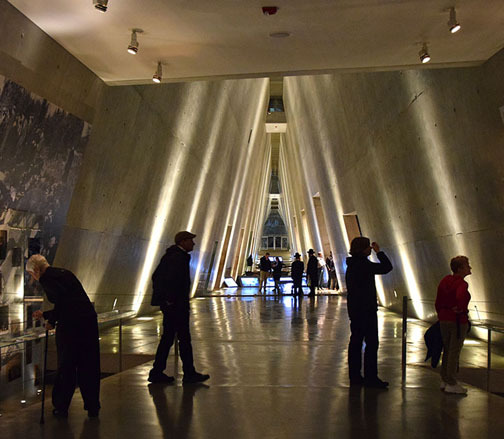 I could not take pictures at the Holocaust Museum so these photos are from the internet. 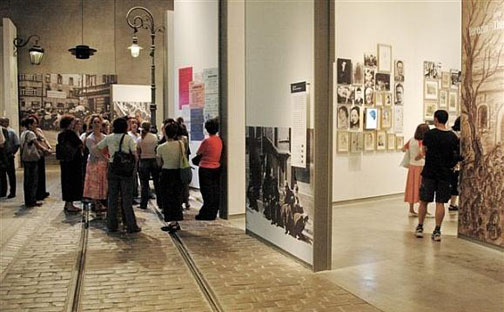 The museum is designed with triangles and is filled with displays of personal materials belonging to those lost as well as testimonies of survivors. I was amazed by the amount of photographs documenting events, both historical and personal, that were on display along with movie footage. 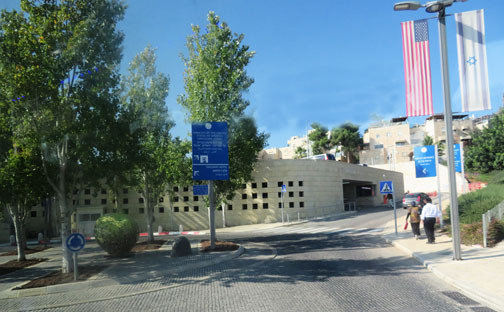 We drove by the US Embassy, now located in Jerusalem. Betsey and I spent a day visiting some of the various quarters in the Old City: the Muslim, Jewish, Armenian, and Christian (Orthodox and Catholic) areas. 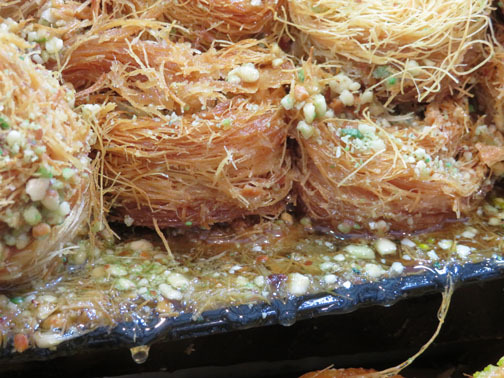 The streets were narrow and a great many were markets filled with locals, tourists, and pilgrims. 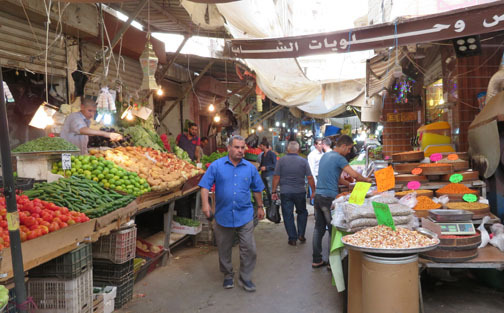 We strolled through very crowded market areas as well as narrow lanes with only a few people. 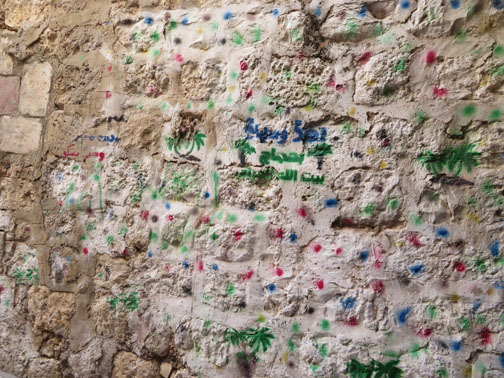 We noticed that some walls had dots and symbols painted on them and learned that these were the homes where Muslims who had made Hajj, a pilgrimage to Mecca, lived. We met a shop keeper on one of the narrow streets who invited us to climb some stairs that led to roof tops with some great views of the city. We did not visit the Dome of the Rock because to go to the top of the platform meant standing in a line for more than an hour. Also, non-Muslims cannot enter the mosque, so we viewed it from a distance. 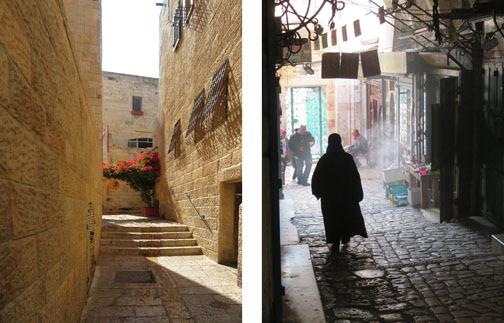 Bethlehem was a side trip from Jerusalem. 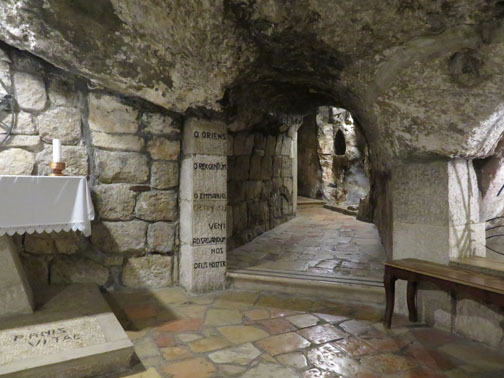 There we learned that Jesus was not born in a barn, but a cave. 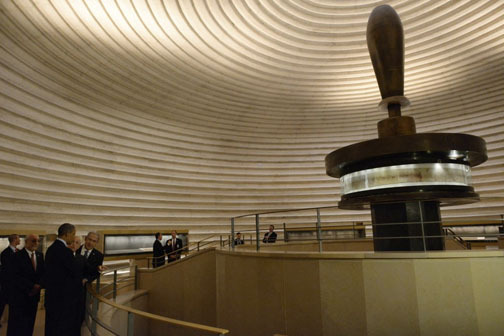 The stable that we picture as a wooden structure does not exist in Israel because they do not have any wood. Instead, everything is built of stone. 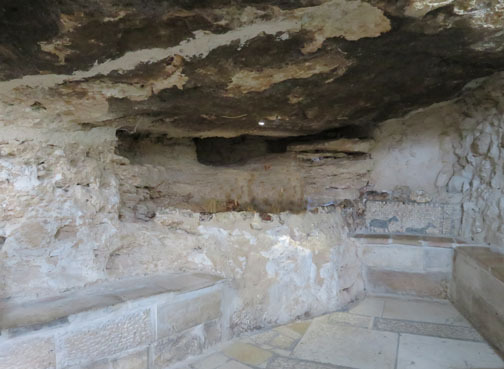 In Bethlehem, people lived in caves, naturally formed and then expanded on by hand. Our guide explained that people back then slept in upper levels and used the ground level for cooking, eating, and housing animals. So when Joseph and Mary were told there was no room in the inn, it meant the upper level was full. 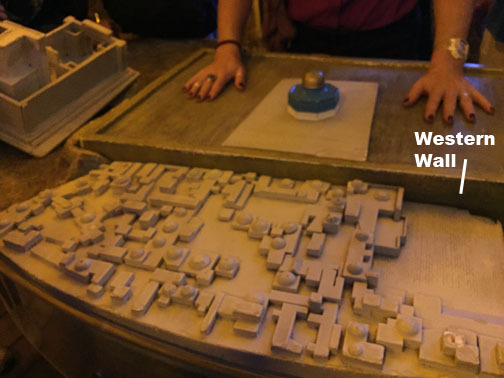 They then settled for the ground level which was made up of multiple chambers. He took us to see what one of these caves looked like. 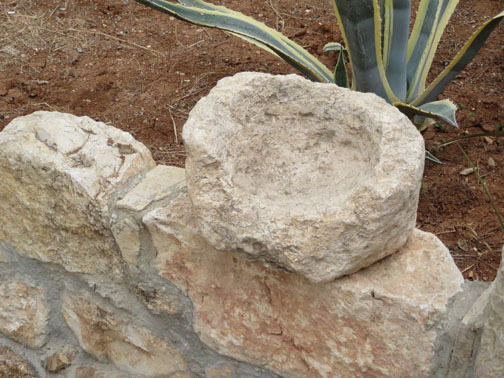 And the manger, a feeding trough for animals, was not wood, but stone as well. 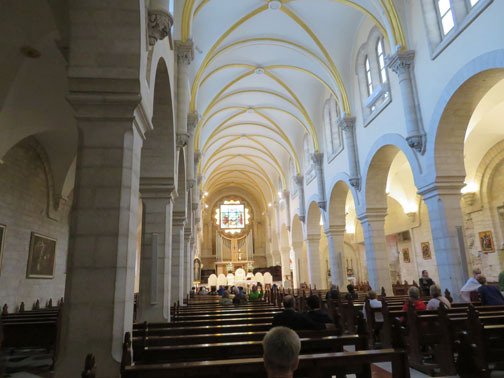 We then visited the Church of the Nativity, built over the place where Jesus is believed to be have been born. This is the unimpressive facade of the church. It originally had three large doors, but the door on the left is covered with a wall buttress that was built to add support and the left door is hidden by part of a monastery that was built later. The center door was once quite large, but was made smaller to keep camels and horses out. But the arched door was still used by horses, so they made it even smaller. It is called the Door of Humility since everyone had to bow to enter. The interior has been undergoing a lot of restoration. 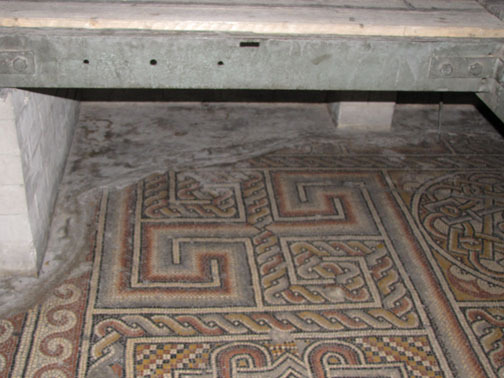 At one time, the floor was 2 feet lower than it is today, where 4th century Byzantine mosaics were found. There was a section that was tented over while restoration continues. We were able to find a peephole and saw an archaeologist at work. 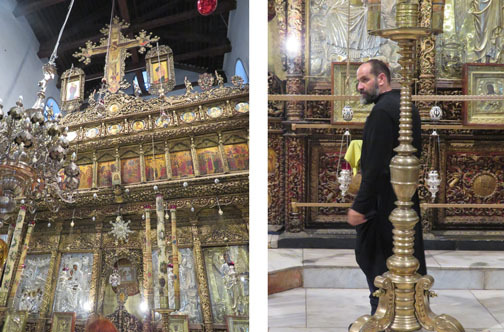 The church is Greek Orthodox so the altar area was quite elaborate. There was a huge line of people waiting to go down to see the birth place, so we decided not to wait. Instead, we viewed the church and entered the church next door, only to be have our guide lead us down to the cave from another entrance. He took us to an adjoining part of the cave where the stone was still original. From here we could look through a tiny hole in a door and see the chamber where the birth took place. It has been decorated to the hilt and does not resemble a cave at all. I took this photo off the internet. The church next door, St, Catherine’s, is where Christmas Eve services are televised. 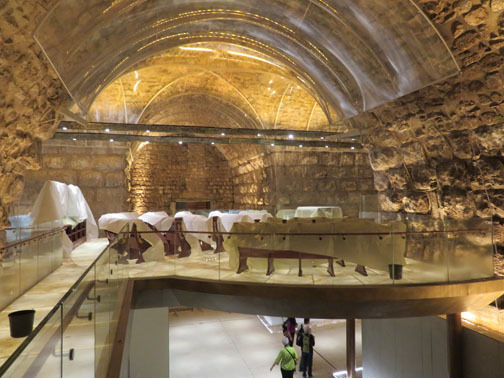 Before we left Jerusalem, we visited the Dead Sea Scrolls Museum. Again, photography was not permitted so here are more images from the internet. The scrolls were found in jars with covers and the roof of the museum was shaped like one of these covers. The interior is round with display cases around the walls as well as on an elevated platform. This photo was taken when President Obama visited the museum. Notice the dark spots in the mountains. Those are the caves where they were found in ceramic jars. 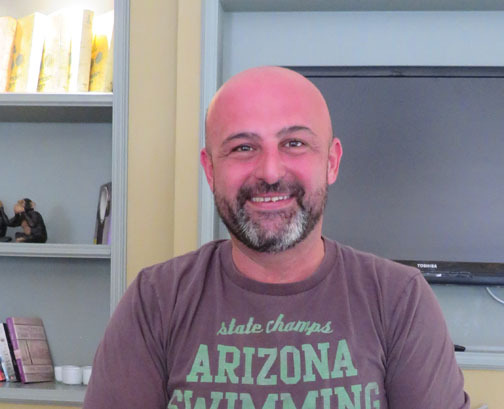 This entry was posted in Israel on November 10, 2018 by JWH. 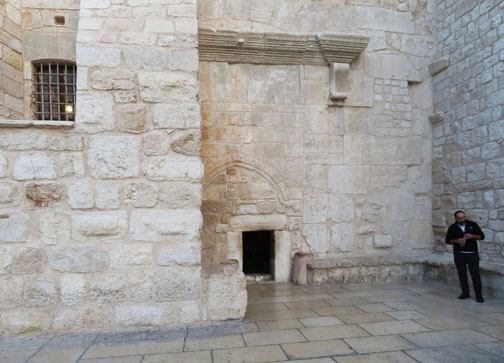 We visited the Old City of Jerusalem where we visited a series of tunnels and cisterns under the Muslim neighborhood next to the West Wall of the Temple Mount. 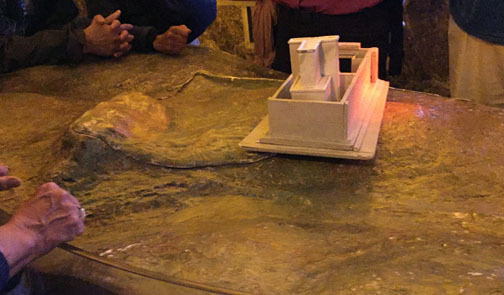 To understand the layers of history of the area, our guide used a model of the Mount. This shows the Mount as it was initially. 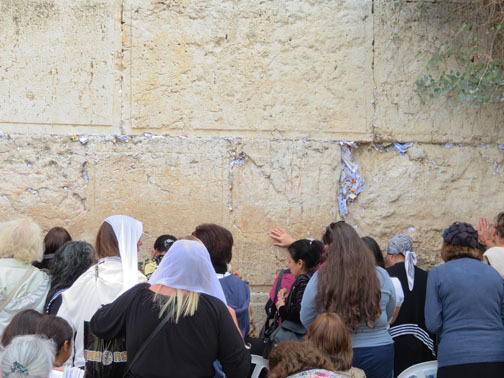 The Jews believe that civilization was created here and that God is present here. 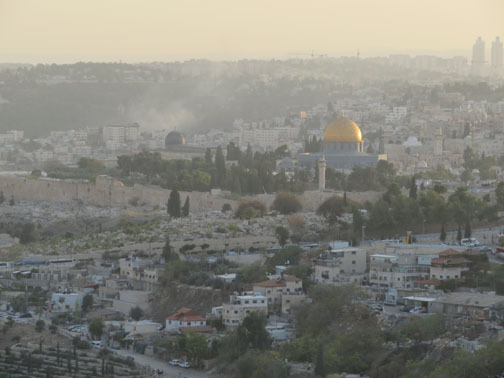 King Solomon built the First Temple on the Mount in 957 BC. The Babylonians destroyed it. Herod the Great, raised as a Jew, was a vassal of the Roman Empire and was granted the title of King of Judea. 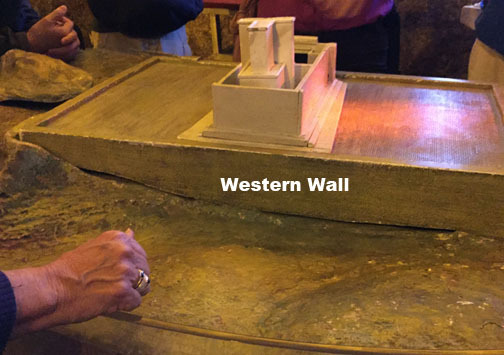 He built a huge platform on the Mount surrounded by walls in 20 – 18 BC. He then built a Second Temple. Here is another model looking at the Mount form the East. The Roman Emperor, Titus, destroyed Herod’s temple in 70 AD, drove the Jews out, and sacked Jerusalem of its wealth. He returned to Rome and built the Colosseum with the spoils. 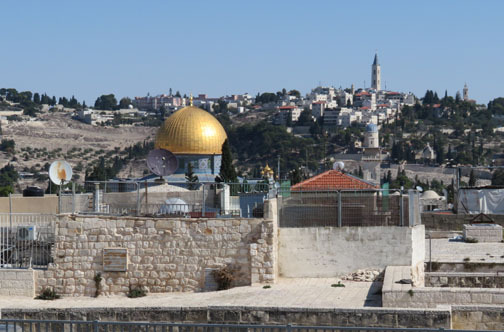 A Roman temple was built on the Mount, but then the Muslims invaded and built the Dome of the Rock in 691 AD on the platform that Herod had originally built. Then the Muslims wanted a higher access to the Mount so they built a series of tunnels with arches as an elevated foundation and built their city on top. And that is the way it is today. 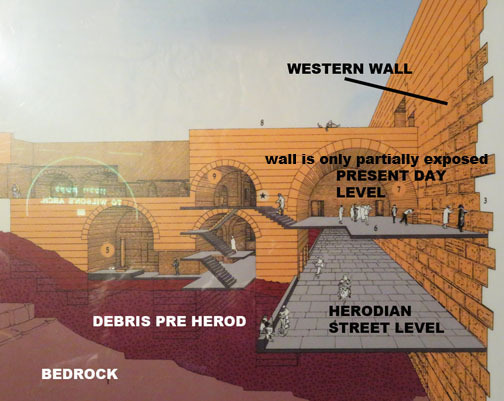 The total height of the retaining wall was 105 feet when Herod built it but only 62 feet are exposed today. 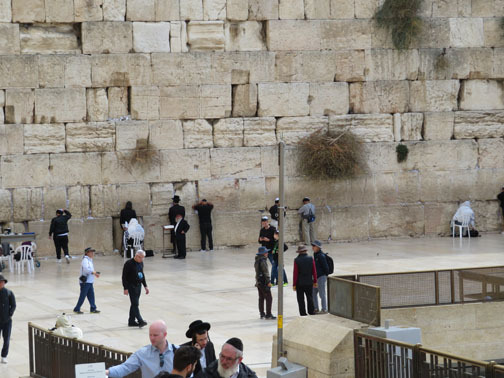 The closest that Jews can get today to the site of the First and Second Temples is the Western Wall. 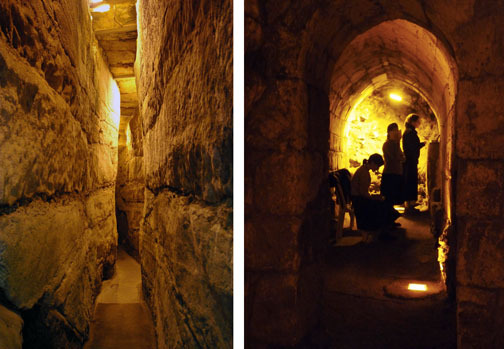 Only a portion is accessible at street level (a width of 230 ft.), but 1591 more feet of the wall is accessible underneath the Muslim city by the tunnels that run along its length. 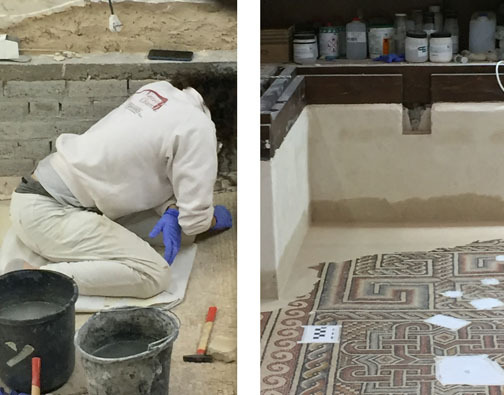 Excavations began after the Six Day War (1967) and continued for 20 years. 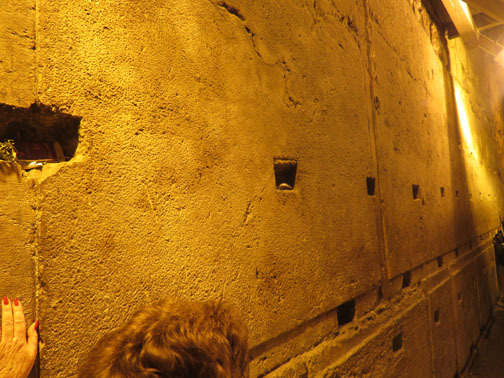 We walked through the tunnels and were able to see lower parts of the wall that Herod built. 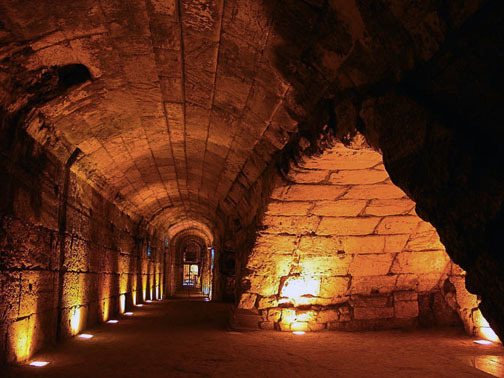 Some of the chambers are very large and in some areas of the tunnels there are two elevations. 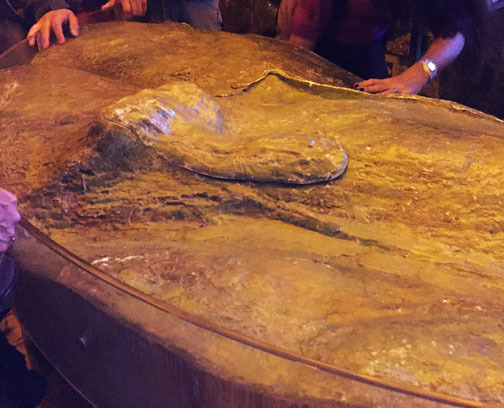 This rock is 45 ft. wide, 9.8 ft. high and 11 ft. thick. It weighs 570 tons! It is the largest rock moved by humans without modern equipment! 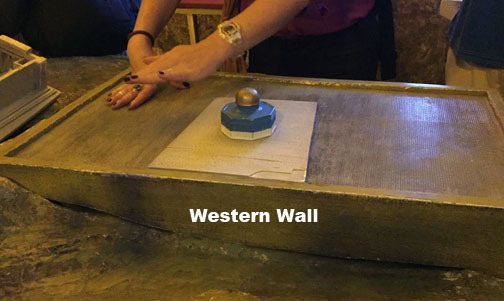 Right: One section of the underground Western Wall is used by Jewish women to pray. 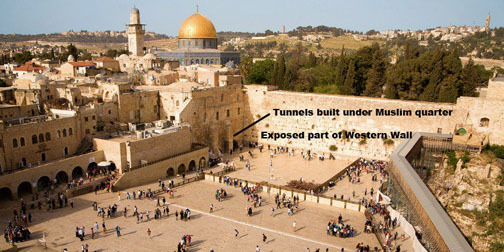 Left: Tunnels running along the Western Wall have been connected with a tunnel used for water that was constructed by the Maccabees. There were some very tight passages. 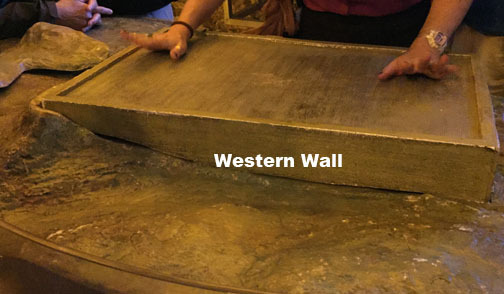 After walking through the tunnels, we visited the above-ground Western Wall. Women and men each have their own part of the wall. 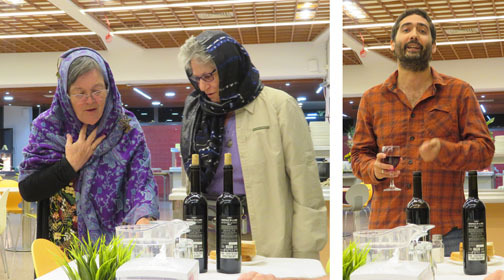 Betsey referred to me as Mother Theresa in this photo, but I doubt that MT would have worn such a colorful scarf…. The arrow points to where I inserted my tiny note. I had to work to poke it into the crack. Jerusalem is a great place to people watch because people come here from all over the world and some religious people wear interesting outfits. 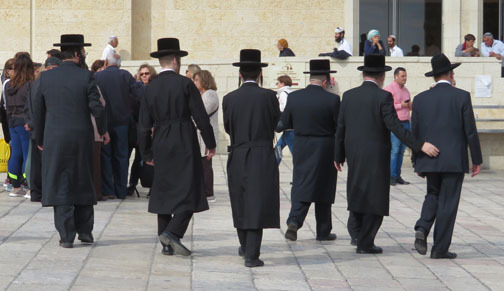 Here are some Hasidic Jews. 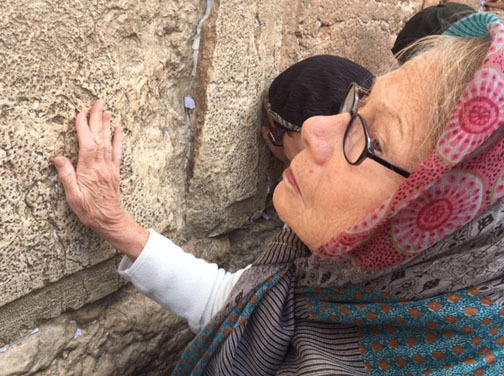 This entry was posted in Israel on November 7, 2018 by JWH. 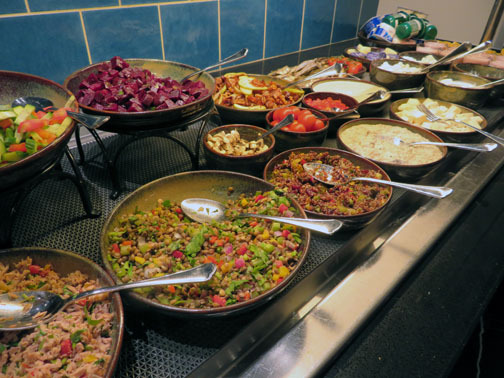 In Galilee we stayed at a Kibbutz. 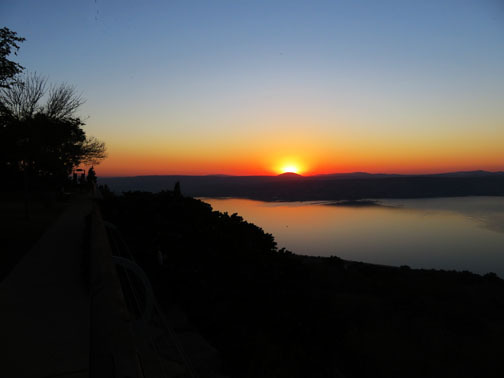 We each had cabins overlooking the Sea of Galilee. We arrived in time to see the sunset. The red roofs are the cabins. 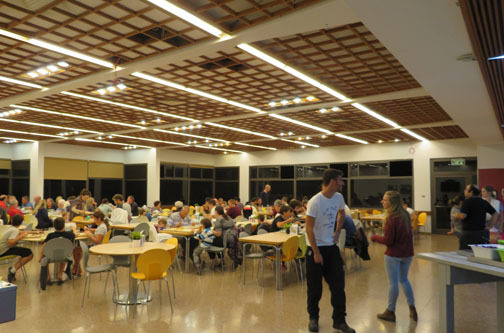 We had dinner in the kibbutz dining room and because it was Friday evening, two women in our group and our tour director’s husband performed the Shabbat rituals. 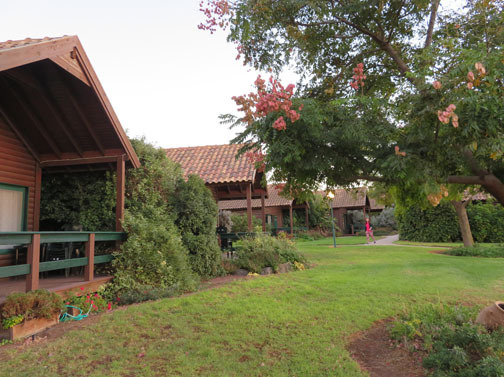 The kibbutz is 50 years old, is about 3 miles by 3 miles in size, and has 412 members. 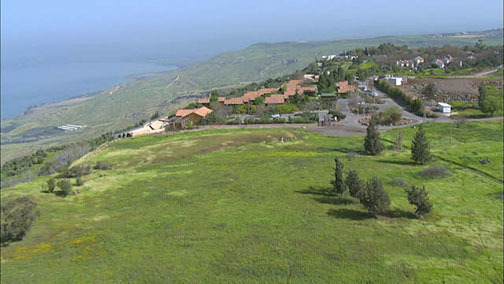 It is located in Golan. Besides farming, they have other businesses including a valve company that has branches in the US, Mexico, Russia, Brazil, and China. They make water and wastewater values – like check values. 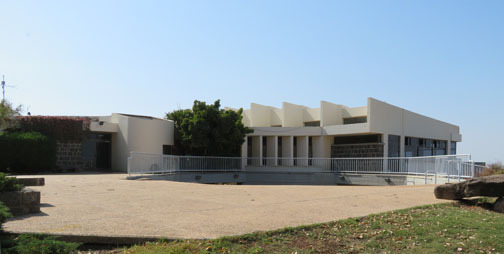 The company produces the largest percentage of income for the kibbutz. 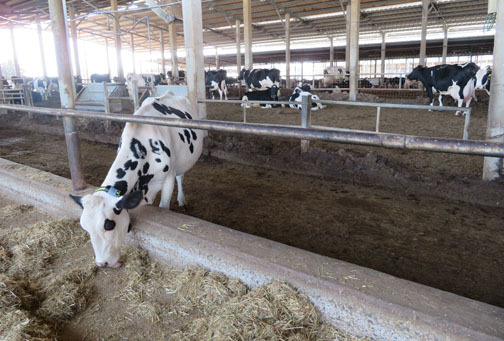 They also have a dairy herd of 500 milk producing cows and a day care for pre-school children. 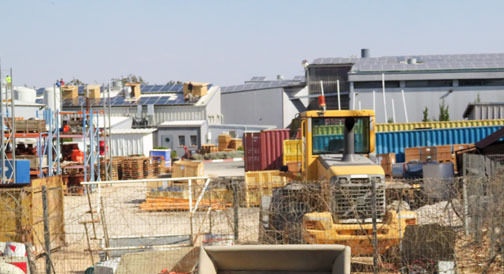 Members of the kibbutz work, but they also hire outside of the kibbutz. They have housing, a medical clinic, children’s areas, community centers, a dining room, a pub, a fleet of cars for the members to use, and bomb shelters. The bomb shelters are required of all kibbutzes since many of them are located along disputed borders. 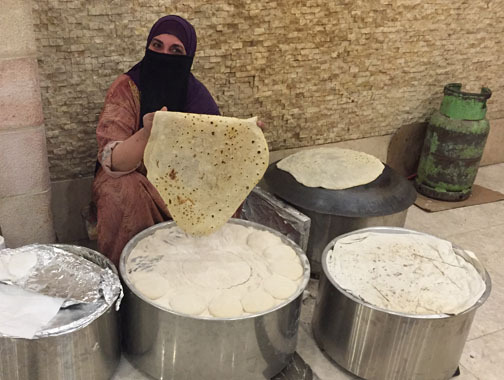 Because of their location, the Israeli government gives them a tax break. 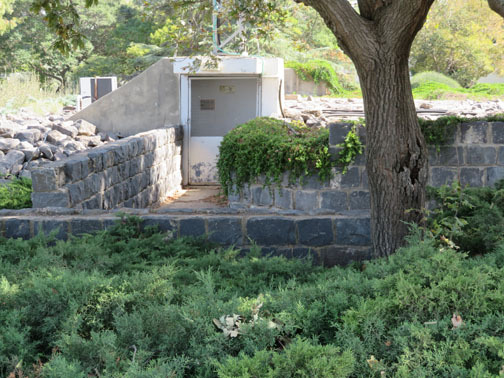 This is one of the bomb shelters. Some of the shelters are used for activities – like yoga and meetings. We visited the cow barns. 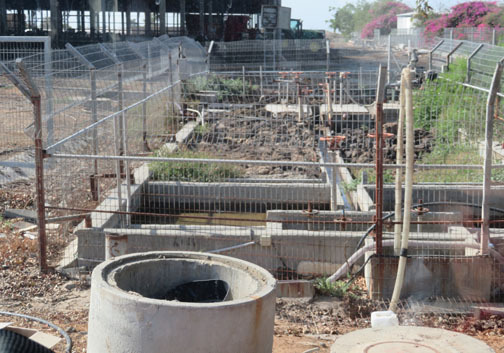 Since we stayed in the kibbutz cabins, we were invited to participate in the kibbutz experience by doing some work. 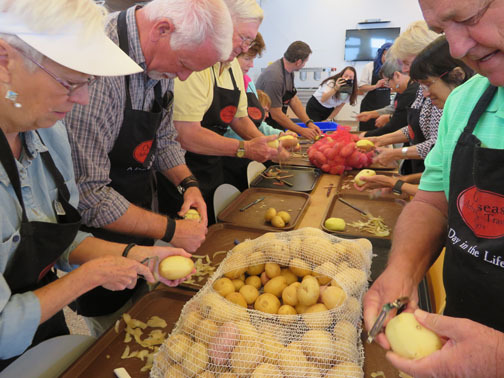 We peeled potatoes. 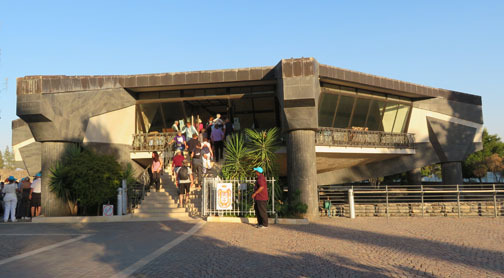 While in Galilee we visited a church built to commemorate Jesus’ Sermon on the Mount. (The actual site of the sermon was not here, but was close by.) The church was built in the 1930’s and was funded in part by Benito Mussolini. 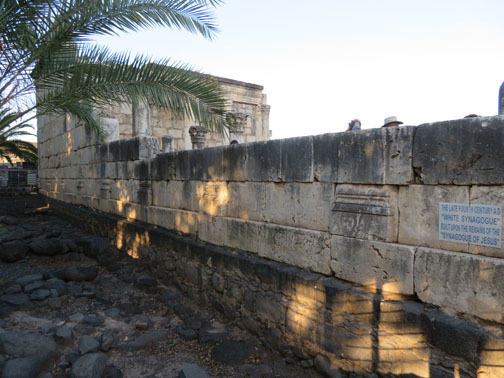 We also visited Capernaum where Jesus stayed with Peter’s mother-in-law after leaving Nazareth. A very early church was built over her house, and then another church built over that, and even more. Today a church that looks like a space ship sits over the archaeological site. 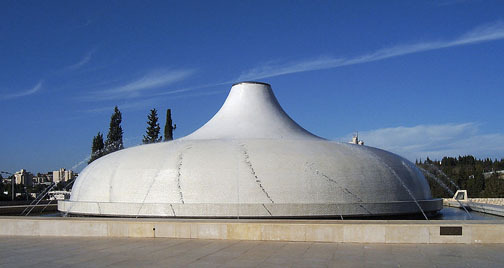 Next to the site is a Jewish temple that was built on top of an earlier one. 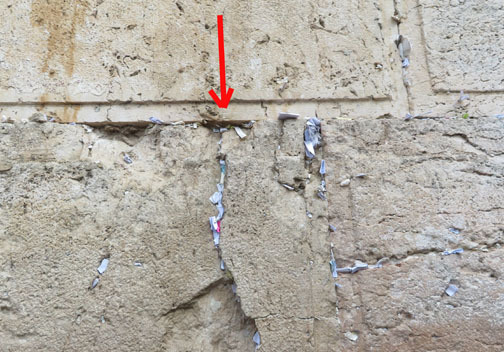 The dark stone is the temple that dates from the time of Jesus. 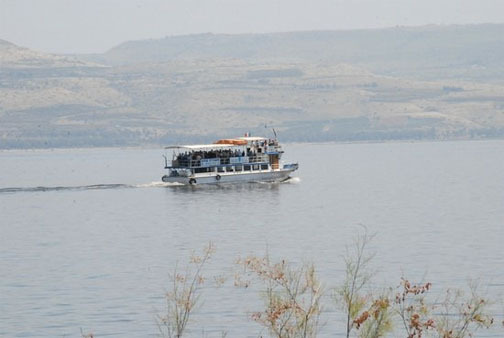 While in the area, we took a short cruise on the Sea of Galilee. We visited a museum that houses a wooden fishing boat that is 2000 years old. 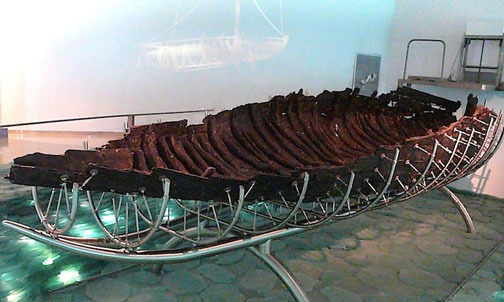 It was discovered in 1986 and the museum displays explain the elaborate process of removing the boat from where it was buried in wet sand and preserving it for display. The wood was so fragile that it was about to fall apart so it had to be held together with sprayed on plastic foam (like insulating material) while it was removed and then chemically treated to stabilize the wood. The process was fascinating. 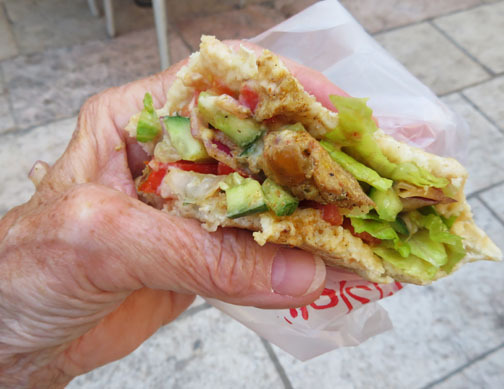 This entry was posted in Israel on November 4, 2018 by JWH.